Interstate 670 travels east along an elevated viaduct over the West Bottoms industrial area to Quality Hill outside Downtown Kansas City, Missouri. Photo taken 06/19/15. Designated the Jay B. Dillingham Freeway, Interstate 670 is a short urban connector linking Interstate 70 in Kansas City, Kansas with Interstate 70 and U.S. 71 at the southeast corner of Downtown Kansas City, Missouri. I-670 provides a direct east-west route for through traffic along I-70 as the parent route loops north around the Central Business District. The Dillingham Freeway travels along a viaduct from the Kansas River bridge and I-70 east to Interstate 35 and the Alphabet Loop. The Alphabet Loop is the nickname given to the belt route encircling Downtown Kansas City along the combination of I-35, I-70, U.S. 71 and I-670. All off-ramps along the loop are numbered as Exit 2 with lettered suffixes from A to Z. Interstate 670 makes up the south leg of the loop as it passes below Kansas City Convention Center through a pair of tunnels to the immediate east of I-35. The remainder of I-670 travels below-grade freeway with a 45 mile per hour speed limit to Interstate 70, U.S. 40 and U.S. 71 by the Paseo West community. The south leg of the Alphabet Loop defaulted traffic onto Interstate 35 (Southwest Trafficway) to the west. Downtown Kansas City – 1969. Interstate 35 utilized the I-670 freeway to make the connection with the Southwest Trafficway from the Midtown Freeway until the west leg of the Alphabet Loop was completed. I-670 was extended east over the south leg of the Alphabet Loop when Interstate 35 was relocated to run along the north and west legs of the downtown belt route. 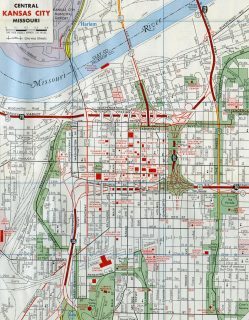 Missouri applied to AAHSTO for these route changes on November 15, 1975. Action on I-670 was deferred at that time while the I-35 relocation was approved on November 12, 1976. Approved by voters in 1973, the Kansas City Convention Center was located wholly north of Interstate 670 between Broadway and Wyandotte Street in southwest Downtown when it opened in 1976. A major expansion project for the complex broke ground on October 24, 1991 to more than double the size of the Bartle Hall exhibit space.5 Supported by four 260 foot pylons, the new Bartle Hall was constructed above Interstate 670 between Broadway and Central Street. The $144.4 million facility was formally opened by the city during a ribbon cutting ceremony held on September 24, 1994.6 A second lid over Interstate 670 would be added later. Kicking off with a ceremonial groundbreaking on June 17, 2015, further expansion of the Kansas City Convention Center complex added the Grand Ballroom over I-670 between Central and Wyandotte Streets. The initial budget of $145.1 million included $7.6 million in state funds to both demolish the closed westbound on-ramp from Wyandotte Street and remove the Central Avenue overpass above I-670.7 The ballroom opened on April 28, 2007. Interstate 670 emerges from below the Grand Ballroom of the Kansas City Convention Center to expand to three eastbound lanes at the Baltimore Avenue overpass. The freeway travels below grade between the Central Business District and Crossroads communities to Exits 2N and 2M with I-70, U.S. 40 and U.S. 71. Photo taken 06/18/15. Passing below a pedestrian bridge by the Sprint Center, I-670 advances to within one quarter mile to Exit 2N for I-70 (unsigned here) west & U.S. 71 north to Interstates 29 and 35 north. I-29 begins a 755-mile route to Pembina, North Dakota (south of Winnipeg, Manitoba) 0.7 miles to the north at Exit 2G. Photo taken 06/18/15. An end sign for Interstate 670 precedes the Holmes Street overpass as Exit 2N partitions for I-70-U.S. 40 west & U.S. 71 north. U.S. 71 accompanies I-29 north to St. Joseph. The remainder of I-670 east extends to The Paseo (Exit 3A), where Interstate 70 overtakes the freeway. Photo taken 06/18/15. Exit 2M takes motorists onto Bruce Watkins Drive, a partial freeway leading U.S. 71 south to the Three Trails Crossing Memorial Highway exchange with Interstates 49, 435 and 470. The US highway south from Grandview to Pineville was redesignated as new I-49 in December 2012. Photo taken 06/19/15. Interstate 70 descends below street level as it passes by Exit 3C for Prospect Avenue. Exit 2L for Interstate 670 west to I-35 south is just one mile to the west. Photo taken 10/17/04. Interstate 70 & U.S. 40 travel west from Independence Plaza to Paseo West and the split with Interstate 670 (Exit 2L). Signs for I-670 reference the urban loop as Alternate I-70 for through traffic bound for Topeka and points west. Photo taken 06/18/15. High rises from Downtown Kansas City come into view as Exit 3A leaves for The Paseo. Interstate 70 & U.S. 40 west merge with U.S. 71 north at the east end of I-670. U.S. 71 enters the exchange from Bruce Watkins Drive and Hospital Hill. There is no direct access to the US highway south from I-70 west. Photo taken 06/18/15. The westbound mainline of Interstate 70 transitions directly onto the south leg of the Alphabet Loop as Interstate 670. Local ramps depart from both the I-670 beginning and turn of I-70 north for local streets into Downtown. Photo taken 06/18/15. Exits 2P and 2Q quickly leave I-670 (Dillingham Freeway) west for Downtown and the Sprint Center. I-670 continues west to the Kansas City Convention Center and West Bottoms industrial area. Photo taken 06/18/15. Four lanes of Interstate 70 & U.S. 40 continued west to the directional interchange (Exit 2L) with Interstate 670 and U.S. 71 (Midtown South Freeway). Sign changes made here replaced the I-670 sign to include a left exit tab. Photo taken 10/17/04. Exit 3A drops from I-70 west to The Paseo and the surface street connection to U.S. 71 south. Signs for Exit 2L omitted Interstate 670 at this time. Photo taken 10/17/04. The speed limit drops to 45 mph as Interstate 70 enters the Central Business District area. There are several close exit and entrance ramps on the pending stretches of I-670 and I-70, all part of the Alphabet Loop exit numbering scheme. Photo taken 10/17/04. Prior to the completion of Interstate 670 west into Kansas City, Kansas, the south leg of the Alphabet Loop was signed as simply a connection to Interstate 35 south to Wichita. Photo taken by Michael Summa (1982). Interstate 70 & U.S. 40 turn south from I-29 & 35 to overlap with U.S. 71 for 0.35 miles to Interstate 670 (Exit 2L). Photo taken 06/19/15. Interstate 70 east and U.S. 71 south separate at Exit 2M. U.S. 71 shifts to the Midtown South Freeway beyond I-670 (Exit 2L) southward through Hospital Hill en route to Interstate 49 . Photo taken 06/19/15. An arrow per lane sign replaced this set of overheads on I-70-U.S. 40 east & U.S. 71 south ahead of Exit 2L to Interstate 670. Joplin was added for U.S. 71 south, reflecting the 2012 designation of Interstate 49. Photo taken by Jeff Morrison (05/14/07). Westbound Interstate 670 reaches Exit 1B for Wyoming and Genessee Streets to Kemper Arena. The Dillingham Freeway crosses a viaduct to the Kansas River and Armourdale in Kansas City, Kansas. Photo taken 10/17/04. Exit 1A for Central Avenue provides access to I-70 & U.S. 24-40-169 east in addition to U.S. 69 (7th Street) north and Riverview in Kansas City. Photo taken 10/17/04. Motorists remaining along Interstate 670 (Dillingham Freeway) west beyond Exit 1A default onto I-70 & U.S. 24-40 west in one mile. Photo taken 10/17/04. End shield for Interstate 670 posted at the wye interchange with I-70 & U.S. 24-40 westbound. Photo taken 10/17/04. Interchange sequence sign posted 0.75 miles ahead of the split with I-670 on Interstate 70 & U.S. 24-40 eastbound. 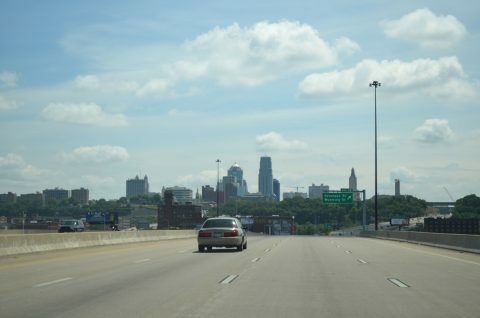 U.S. 69 overlaps with I-70 through this stretch to Exit 422A and Downtown Kansas City, Kansas. Photo taken by Eric Stuve (11/30/02). Three lanes separate from the left side of I-70 east for Interstate 670 into Kansas City, Missouri. I-70 turns north along side the Kansas River with two though lanes beyond Exit 421B. Photo taken by Eric Stuve (11/30/02). Interstate 670 eastbound from I-70 east at Exit 421B. 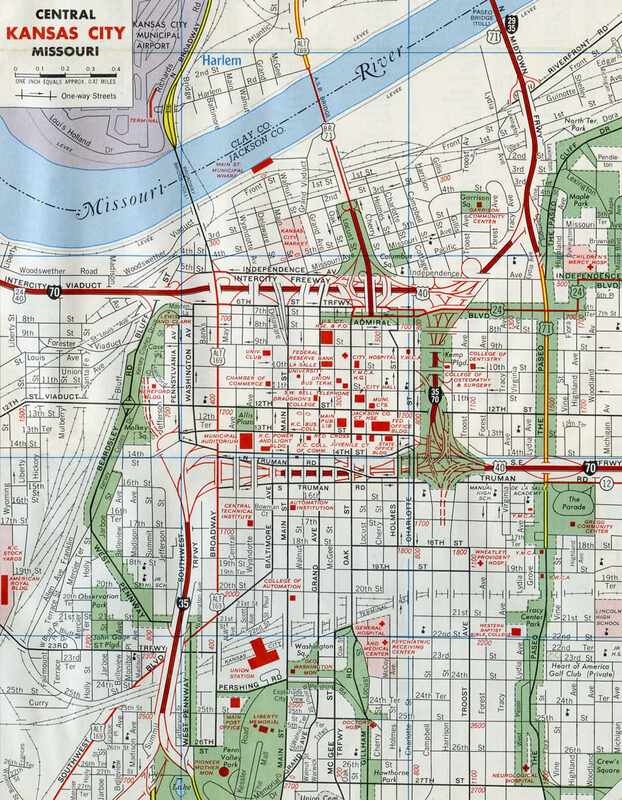 There are no control cities for either highway, as both traverse Downtown Kansas City, Missouri. Photo taken by Eric Stuve (11/30/02). I-70 heads north toward Downtown Kansas City and then east across the Lewis and Clark Viaduct into Missouri. I-670 runs across the south side of the West Bottoms industrial area between the Kansas River and Downtown Kansas City, Missouri. Photo taken by Eric Stuve (11/30/02). The I-670 viaduct spans westbound Interstate 70 & U.S. 24-40-69 at the exchange (Exit 422C) with Pacific Avenue. Photo taken 10/17/04. The wye interchange with the west end of I-670 overlays the parclo with U.S. 169 south and the 7th Street Trafficway. There is no access to I-670 east from I-70 westbound. Photo taken 10/17/04. “6-Lane Link to Tie Freeway and I70.” The Fort Scott Tribune, December 29, 1971. “Interstates show wear of 35 years More traffic, stress of weather, heavy trucks damage nation’s roads.” The Kansas City Star, August 4, 1991. “I-670 project wins top award from Consulting Engineers Council.” The Kansas City Star, March 31, 1991. "City breaks ground on Bartle expansion But building over freeway and finishing in time for the first convention are top concerns." Kansas City Star, The (MO), October 25, 1991. "Bartle Hall begins its next expansion." Kansas City Star, The (MO), June 18, 2005. "Bartle Hall basks in the spotlight of expansion opening." Kansas City Star, The (MO), September 24, 1994. "Downtown routes will change this week." Kansas City Star, The (MO), January 2, 2006. "With bridges open, downtown will get a little easier to navigate." Kansas City Star, The (MO), October 4, 2007. Page updated October 24, 2016.